I can hardly believe back to school is almost upon us! AHHHH! I am loving every second of being just mommy to my little man all day! But, the wheels are turning for back to school and getting ready! 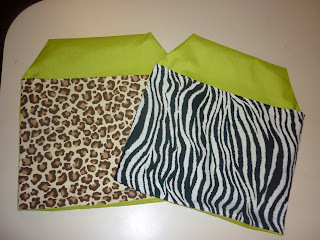 Jodi at Fun in First Grade is having a linky party for your favorite back to school activities. 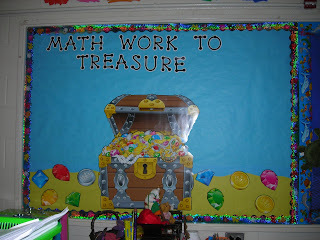 Be sure to check out her blog for some other awesome ideas. Here are a few of my favorites that I had pictures for. One of my favorite back to school activities is the name mosaics. 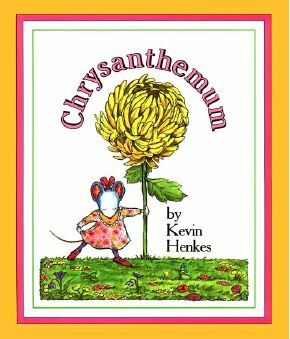 We read Chrysanthemum by Kevin Henkes and discuss how we are all different and unique. We complete this art project to showcase our names. I stumbled across it years ago (someone online, not sure where) and it always brightens up the halls! 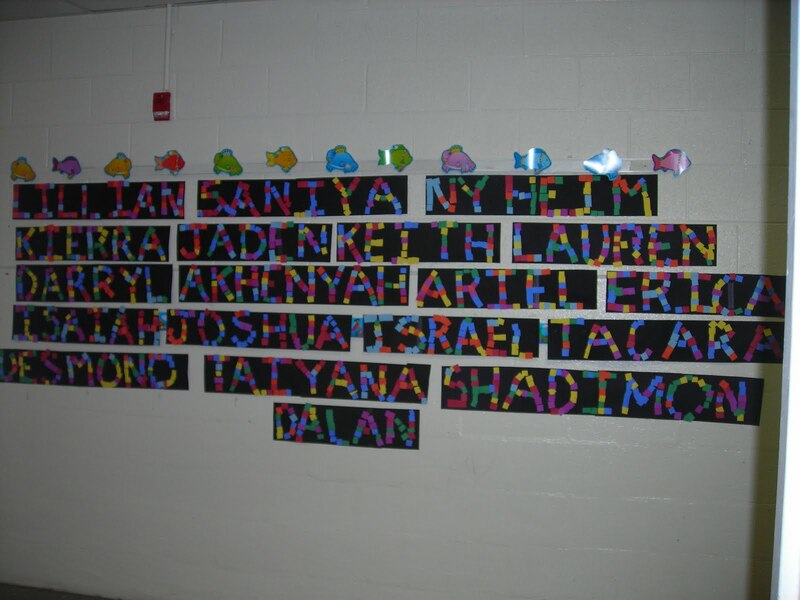 I cut up small pieces of construction paper in different colors and write students' names on a long piece of black paper. They cover their name with the construction paper squares. We learn this poem and add it to our poetry notebooks. Click here for a copy of the poem. My chicka chicka board one year. After reading Chicka Chicka Boom BOom several times, students illustrated pictures for each letter and they were hung under the letters. 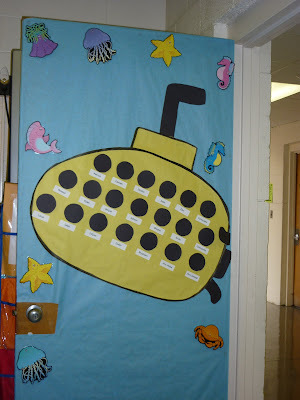 My submarine door. 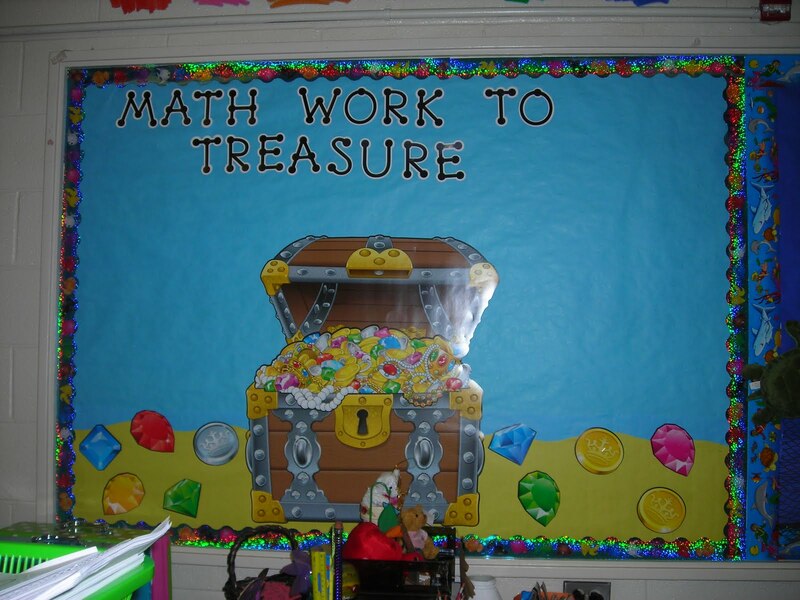 I added students' pictures to the port holes. 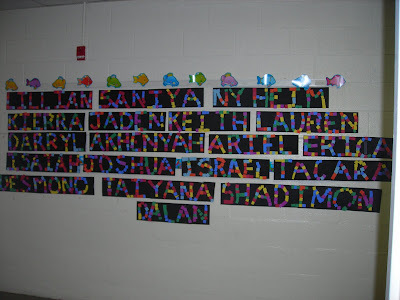 My class from the previous year made the Rainbow Fish at the end of the year. 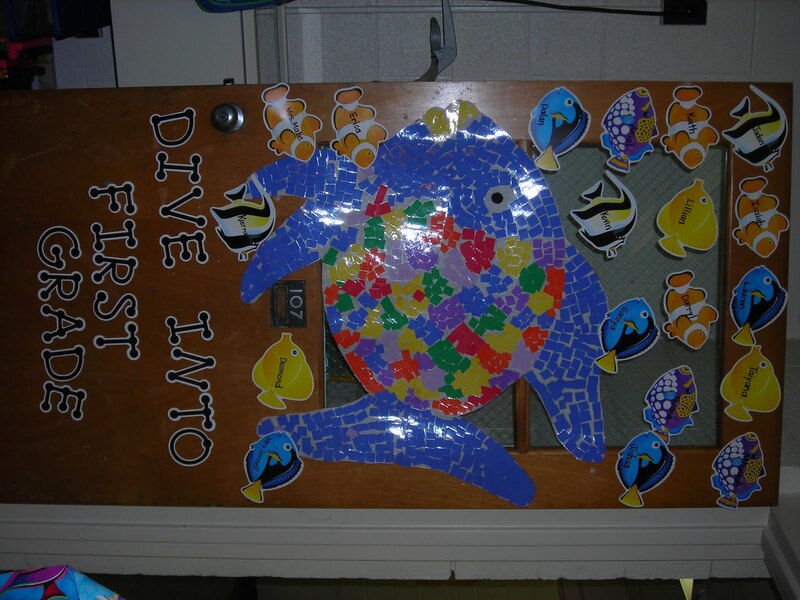 I traced the Rainbow Fish first on white paper and they filled him in with construction paper. It was a great cooperative learning activity for the end of the year. 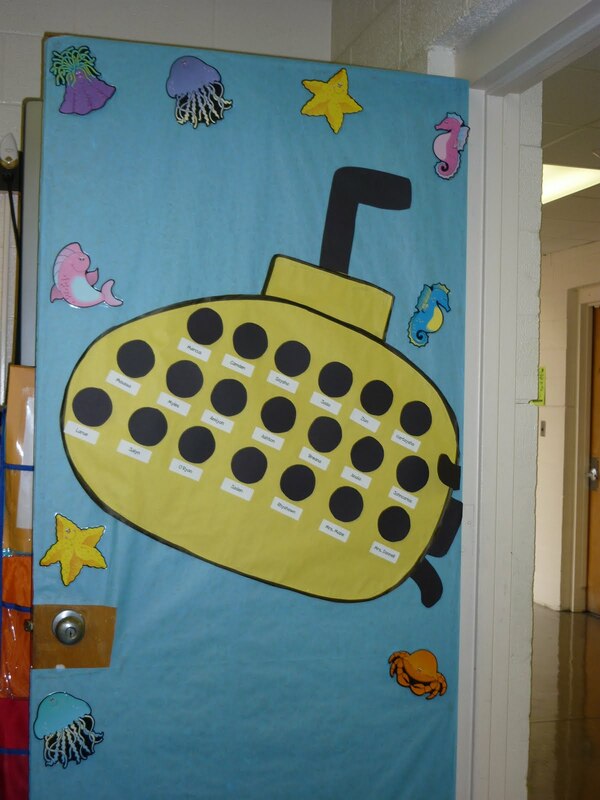 And it made a super cute door display for back to school! Please leave a comment to share any fun Chicka, Chicka boom boom ideas for back to school! Or jungle ideas, since this year my room is going to be jungle/safari themed. I ordered these from Etsy and they were delivered today! Oh my, I'm in l-o-v-e!! They are so cute and will match my room decor quite perfectly. (Click on the pic to go the the Etsy shop where I purchased them.) Once the room is cleaned, organized, and set-up, I will be sure to post pics of my safari theme! Thanks for linking up! I love the name mosaics. I love your mosaic names! I also wrote about a chrysanthemum activity for the linky party. I'm definitely going to have my first gradersmake these mosaic names this year. Thanks for sharing! 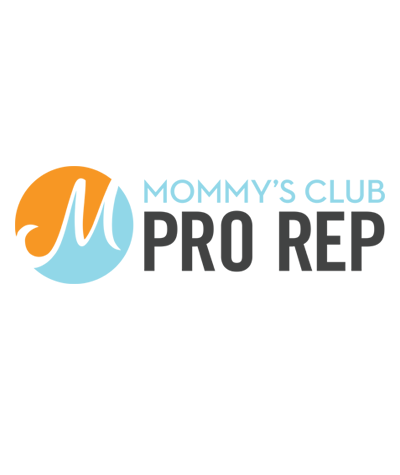 Stopping by from the linky party! I also included Crysanthemum om my list, but I love your idea! I will be using your idea this year! I also love your name mosaics! They look so pretty! 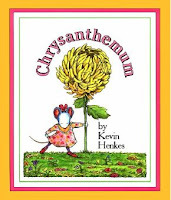 Chrysanthemum is one of my favorite first week stories too! I love your colorful mosaics against the black background! Love this idea! I think the mosaics are fabulous! Thanks for sharing a fresh idea for an old favorite. This is cute. I always use this story for my classroom. We make flower glyph using our names..I could incorporate this too. Thanks for the idea. I love the mosaic names! I just love this art project. I read that book as well as Wemberly Worried the first day, too. Thanks for sharing.